A cascade of gas centrifuges at a U.S. enrichment plant. Relax, Iran’s complying with the terms of the November 2013 interim deal—at least for a few more weeks. As the diplomatic heat turns up ahead of a June 30 deadline for a final deal between Iran and the P5+1 group of powers, news emerged, courtesy of the New York Times‘ David Sanger, that Iran’s “stockpile of nuclear fuel increased about 20 percent over the last 18 months of negotiations.” The article goes on to outline this development as a major setback for the Obama administration, which staked its credibility on its ability to regulate Iran’s nuclear fuel stockpile. Sanger notes that the 20 percent increase in nuclear fuel—specifically, low-enriched uranium (LEU)—undercuts “the Obama administration’s contention that the Iranian program had been ‘frozen’ during that period.” Sanger crescendos to the claim that this development “poses a major political and diplomatic challenge” for the conclusion of a comprehensive agreement. Sanger is both right and wrong, but more wrong than right—in two important ways (as others have already pointed out). Firstly, he’s right, in a very pedantic way, that Iran’s nuclear program was not “frozen.” Indeed, for whatever its worth, an expansion in Iran’s reserves of LEU, marks an expansion, however meaningless, of its “nuclear program.” The U.S. State Department’s Marie Harf and a range of nuclear arms controls experts chided Sanger for a key misconception: that even if Iran’s LEU reserves had grown, this wasn’t in contravention of its obligations under the November 2013 Joint Plan of Action (JPOA)—also known as the “interim” agreement between Iran and the P5+1. Per that agreement, Iran agreed to stop enriching its uranium to 20 percent levels (LEU is defined technically, by the IAEA and others, as uranium with a less-than-20 percent concentration of uranium-235, the uranium isotope best suited for sustaining a fission chain reaction). 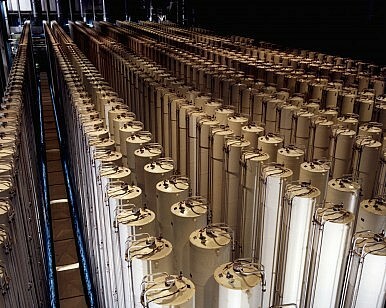 Iran conceded quite a few things per the JPOA—it agree to not install new centrifuges, halt all operations and fuel transfers to the Arak power plant, dilute half its 20 percent uranium stockpile to below 5 percent, and convert the other half of the stockpile to oxide for fuel fabrication (at the Tehran Research Reactor). In addition to these constraints and other technical and transparency-related concessions, Iran received modest sanctions relief and concessions from the P5+1. For the moment, however, the Times‘ report, then, is much ado about nothing. The Iran negotiations remain challenging for the seven parties involved, and there is already much wrangling over silly topics (such as the precise number of first-generation IR-1 centrifuges Iran would be permitted to operate at Fordow). It’s critical that a public debate take place and that journalists and observers scrutinize this immensely significant negotiating process. However, with the 2013 JPOA in place and a framework for a final deal, the negotiations in these last few weeks are taking place with both precedent and structure. The LEU conversion question could be resolved in a number of ways over these next few weeks. For example, if Iran’s domestic capacity for oxide conversion is unsatisfactory, it may agree to have its partially converted LEU taken out of the country. Perhaps Sanger’s article would have been clearer had the administration been more careful about emphasizing that Iran’s nuclear program had been “frozen” since November 2013. It’s true that we’re seeing no more enrichment past 20 percent levels, no centrifuge growth, and no significant progress toward weapons-grade nuclear activity. LEU, of all things, should be a non-issue at this point. LEU stockpiles will be an issue if it remains in excess of 300 kg past June 30 (assuming a final deal is reached by that deadline), and the excess isn’t fed into oxide conversion. So to sum up: 1) the administration should probably not have said Iran’s nuclear program was “frozen,” 2) the administration is right that Iran is not contravening the 2013 JPOA, the only concluded agreement between Iran and the P5+1 to date, 3) Sanger should probably not have said that the increase in LEU would complicate the June 2015 sprint toward a final deal. Based on what happens later this month, and on how well Iran manages its oxide conversion, this conversation may have more pertinence in July 2015 and beyond. Iran Deal Update: 11,000 Kilograms of Enriched Uranium Leave Iran for RussiaReforming the Nuclear Nonproliferation Treaty for New RealitiesThe Nuclear Test Ban: Time to Finish What We StartedEnough Strategic Patience: Time for a New US North Korea PolicyHow Sincere Were Obama’s Threats to Stop Iranian Nuclear Proliferation?